Ten Certificate mining package representing gold mines from Nevada, Montana, Idaho, Canada, Colorado, and California. 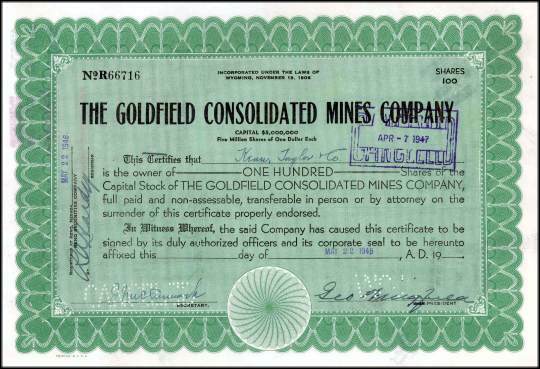 The Goldfield Consolidated Mines Company is hand signed by the Nevada legend George Wingfield. George Wingfield has been a major figure in Nevada history at least since 1912, when he turned down an appointment to the United States Senate. A political and economic titan, he made a tremendous fortune in the gold fields of central Nevada in the early twentieth century, and went on to own a chain of banks, numerous ranches, and several Reno hotels. During his lifetime, there were at least two offers to make a Hollywood movie based on his experiences. For a period of years early in the 20th century, Wingfield could be described without exaggeration as the "Owner and Operator of Nevada." 1. Beautifully engraved Certificate from the famous Tonopah Mining Company of Nevada issued in the 1950's. This historic document was printed by the Security Banknote Company and has an ornate border around it with a vignette of miners working inside of a shaft. This item is hand signed by the company's president and is over 44 years old. 2. Beautifully engraved certificate from the Goldfield Consolidated Mines Company issued in 1946. This historic document has an ornate border around it. This item is hand signed by the Company�s President ( George Wingfield ) and Secretary and is over 57 years old. A controversial figure in Nevada's Political and economic history. George Wingfield associated with state power Brokers and became one himself. He was active in Nevada Republican politics until his death in 1959, never holding public office; he refused an appointment to the U.S. Senate in 1912 and refused a draft for the governorship in 1926. Wingfield gained Wealth and power through gambling and mining ventures. During the depression, amid charges of corruption and manipulation, Wingfield's twelve banks failed, seriously impacting Nevada. He later made s second fortune from the Getchel Mine. A major player in union busting activities. 3. Beautifully engraved certificate from the Pride of the West Silver Mining Company . This historic document was printed H. S. Crocker & Co., Sacramento in the 1863 and has an ornate border around it with a vignette of mountains and is over 140 years old. 4. 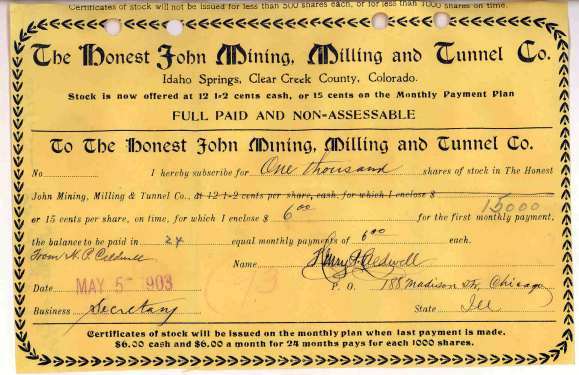 Stock Subscription form from the Honest John Mining, Milling and Tunnel Company dated 1903. This was used for buyers of the company's stock and indicates a monthly payment plan....Shares were sold at 12 1/2 Cents for cash or 15 Cents on a monthly payment plan. 5. Beautifully engraved certificate from the Calumet & Hecla Incorporated. 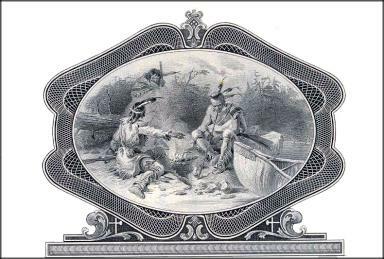 This historic document was printed by the American Banknote Company and has an ornate border around it with a vignette of indians sitting by a fire. This item has the printed signatures of the Company�s President and Vice President and is over 37 years old. 6. 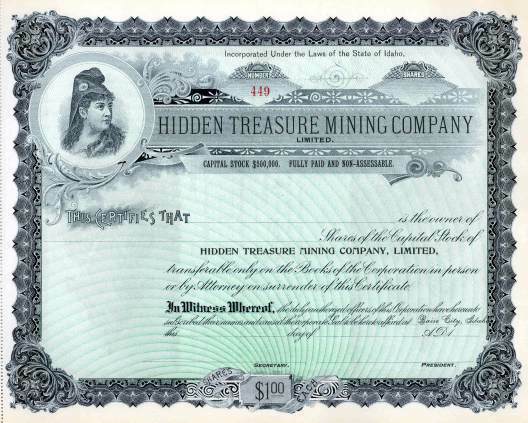 Beautifully engraved unissued certificate from the Hidden Treasure Mining Company, Limited . This historic document was printed in 1895 and has an ornate border around it with a vignette of woman's head and is over 108 years old. 7. 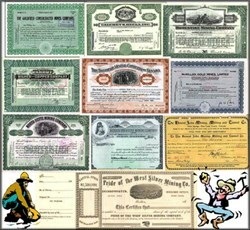 Beautifully engraved Stock certificate from the Homestake Mining Company no later than 1948 for shares of Common Stock. 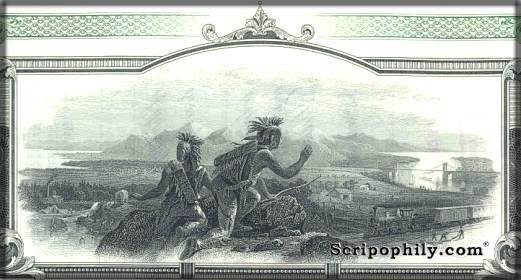 This mining certificate has an ornate border around it with a classic vignette of two indians overlooking a hillside with mountains, a river, train, bridge and ship in the background. 8. 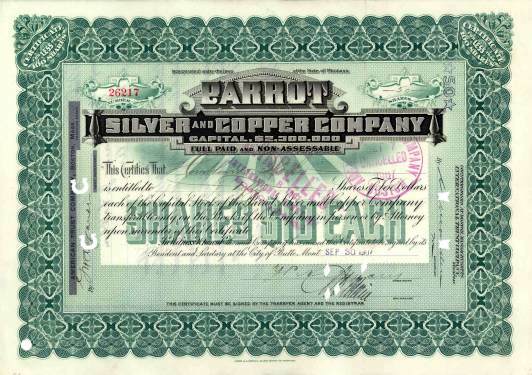 Beautifully engraved certificate from the Parrott Silver and Copper Company issued in 1907. This historic document was printed by the John A. Lowell Banknote Company and has an ornate border around it. This item is hand signed by the Company�s President and Secretary and is over 96 years old. 9. 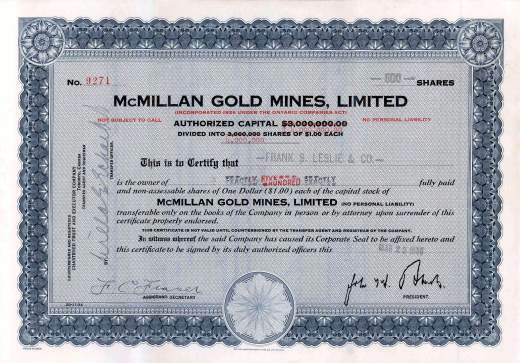 Beautifully engraved certificate from the McMillan Gold Mines, Limited issued no later than 1936. This historic document was printed by the British American Banknote Company and has an ornate border around it. This item is hand signed by the Company�s President and Secretary and is over 67 years old. 10. 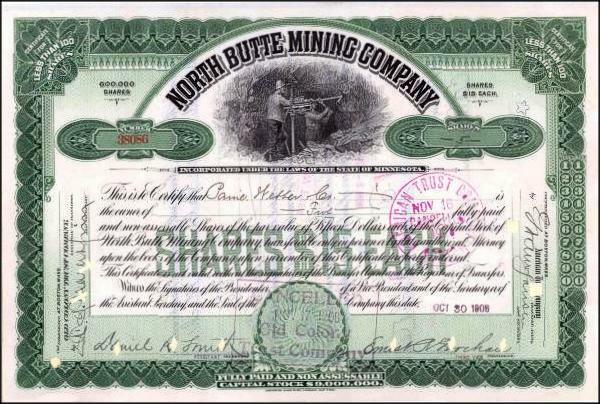 We are offering this historic and beautifully engraved Stock Certificate issued by the North Butte Mining Company dated no later than 1913 for shares of common stock. This item has an ornate green border with a vignette of two miners with a pneumatic drilling machine. This classic certificate is over 90 years old.